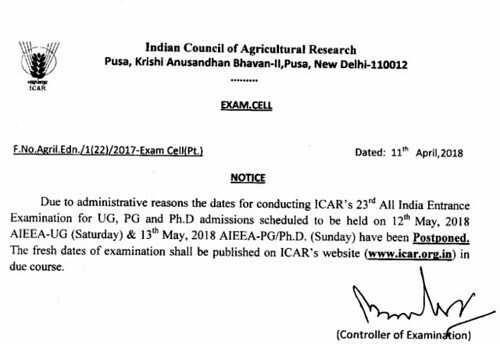 ICAR 2018 Exam Date has bee postponed. ICAR has released a notification on 11 April 2018 which states that ICAR 2018 entrance exam dates have been postponed due to some administrative reasons. ICAR Exam notification was first released in January 2018 which stated that ICAR Exam will be held on 12 & 13 May 2018. Now the exam is expected to be conducted in June 2018. ICAR Exam is known as All Indian Entrance Examination for Admission (AIEEA) and is for admission to Undergraduates, Postgraduates and Doctoral Degree Programmes in various agriculture and allied courses. As specified earlier, according to the previous notification the All India Entrance Examinations (AIEEA) were to be held on 12 May and 13 May. For that, the application process was scheduled to start by the first week of April 2018. But according to the new notification, as the exam dates have been postponed so the ICAR 2018 Application Form is expected to be available from 3rd week of May 2018. But there is no official notification regarding the new dates for the entrance exam. The candidates should stay tuned to MotaChashma.com for latest updates on Indian Council and Agriculture Research (ICAR) 2018 Exam. For more details candidates can read the ICAR 2018 Notification Here. Indian Council and Agriculture Research (ICAR) is an Indian an autonomous body responsible for co-coordinating agricultural education and research in India. ICAR is the largest network of agricultural research and education institutes in the world. Every year it conducts All Indian Entrance Examination for Admission (AIEEA) to Undergraduates, Postgraduates, and Doctoral degree program in agriculture and allied science for filling 15% seats in Bachelor and 25% seats each in Masters and doctoral program. ICAR also awards scholarships through its entrance examination. With 101 ICAR institutes and 71 agricultural universities spread across the country, this is one of the largest national agricultural systems in the world. If you have any query regarding this news, you can write to us in the comments section below.